Each time you make a reservation through this website, your reservation is made directly with Panorama Rooms. As such, you are guaranteed the lowest possible rate, unlike reservations made through third party systems (whose prices include the given platform’s commission). To send a reservation enquiry directly to Panorama Rooms click here! 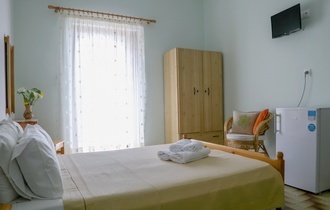 The Panorama Rooms are located in Diros, Laconia, in the Mani area. Built on an elevated location, they offer a breathtaking view of the sea and the area's mountains. They are located 150m (490ft) from the entrance of the Diros Caves, 150m. from the beach, 3km (2miles) from Pirgos Dirou and 300km (187 miles) from Athens. Double, triple and quad rooms are available, equipped with A/C, TV, fridge, bathroom and balcony with lovely view. Special offers Top 10 hotels Add your hotel Email us!